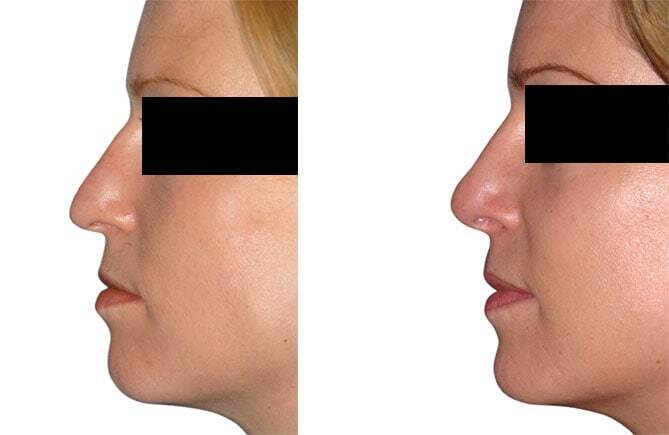 Cosmetic rhinoplasty is by far the most demanding operation in the field of aesthetic plastic surgery. The characteristics of four different types of tissue (skin, mucosa, cartilage, bone) must be taken into consideration with this operation. Moreover, in addition to the aesthetic correction, breathing must also be taken into account. The job of a reputable plastic surgeon is not to reshape the nose of the patients seeking advice, in accordance with prescribed standards, but instead seeking to harmonize unfavorable conditions. The most important progress in rhinoplasty in recent years is, in my view, how the principle changes in the shape of the nasal cartilage are to be performed. Shaping should not be achieved by incision or partial removal but through the use of molding seams and by inserting stabilizing cartilage grafts, so called “struts”. There are three surgical approaches: closed, half-open, open. Each method has its specific indication and pros and cons. 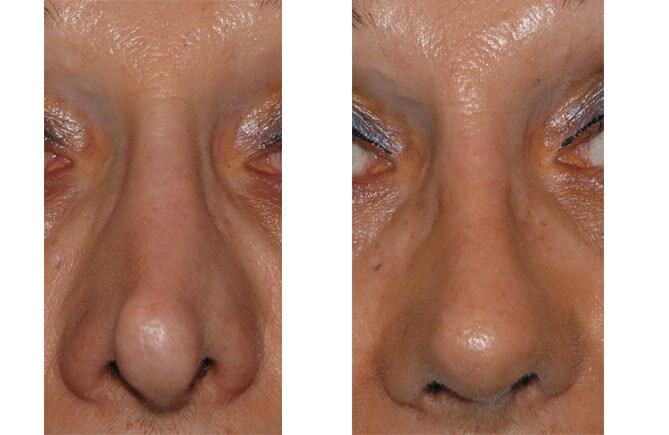 For best results, nose surgeons should master all three methods. The most common corrective actions relate to the hump, the tip of the nose and the length of the nose. During the removal of a nose hump, the nasal pyramid is opened, and there is almost always an “open roof”. 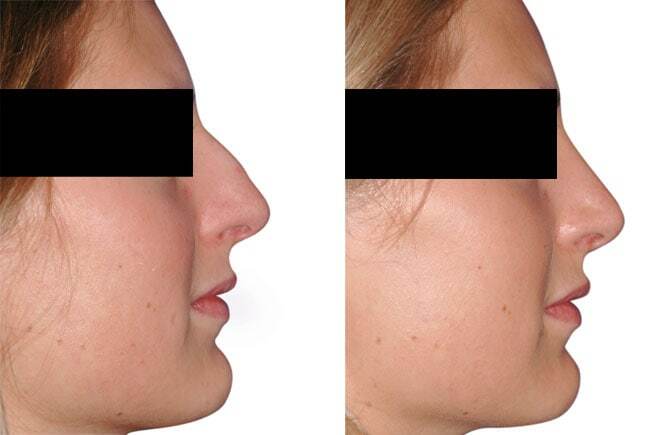 Hereby, an important part of the suspension mechanism of the nasal pyramid is removed, which often leads, after years, to an unpleasant und unsightly collapse of the middle third of the nose (“inverted V-deformity”, “collapse of the middle vault”). Tailored cartilage grafts (“spreader grafts”) can prevent this problem. 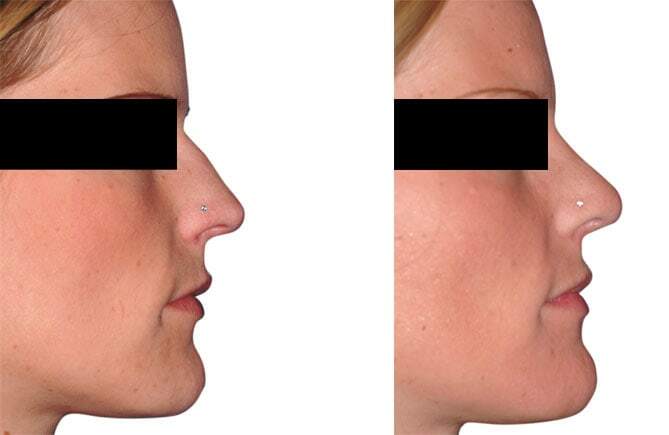 The shaping of the nose is a particularly demanding part of the nose correction, and requires great experience. The tip should represent the highest point of the nose and show two symmetrical, the light refracting vertices. To model the nose, shaping seams can be applied or pieces of cartilage can be introduced. The extent of the correction must be co-ordinated with the skin thickness. The length of the nose, in combination with the inclination angle of the bridge determines the aesthetically particular important nasolabial angle. With a too blunt nasolabial angle, the nose is too short (snubbed), with an acute nasolabial angle, the nose is too long (drooping). The shortening of the bridge is relatively simple, an extension is more difficult. 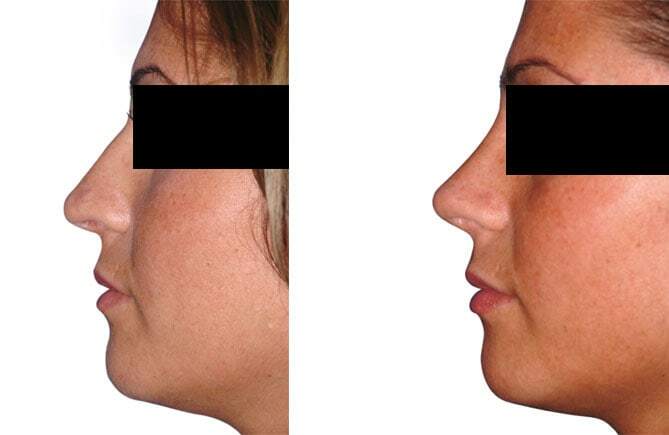 Besides the nose, the chin plays a crucial role in the harmonization of the face. Ideally the foremost point of the forehead and the chin form one level. 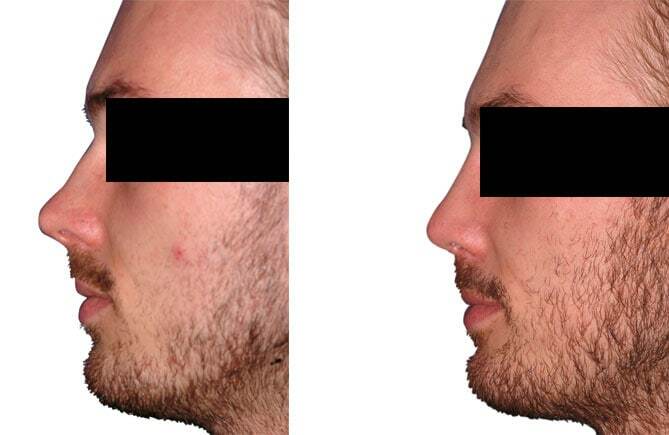 The correction of a receding/protruding chin can remarkably improve the result of an aesthetic rhinoplasty. 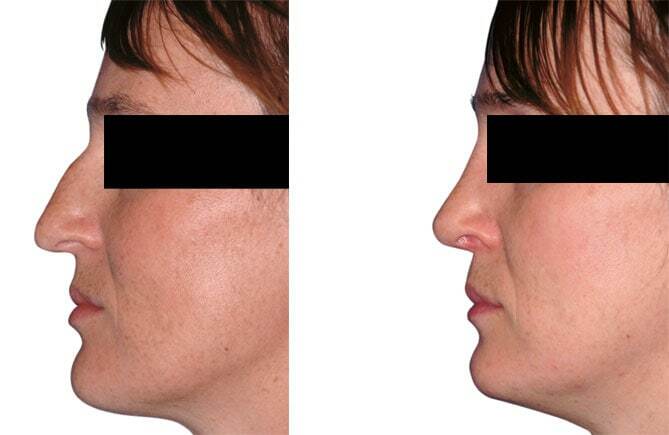 Mostly the length deficit or the surplus is so small that orthognathic measures of the jaw are not necessary and it is possible to correct the chin using minor surgical procedures. 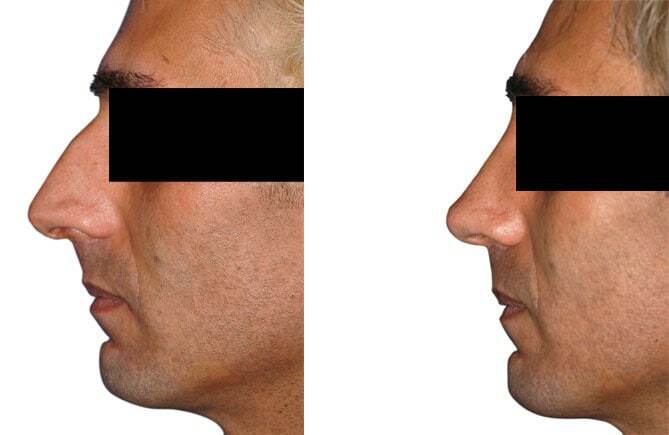 It is amazing that the importance of the chin for the face harmony is completely unknown to most patients. 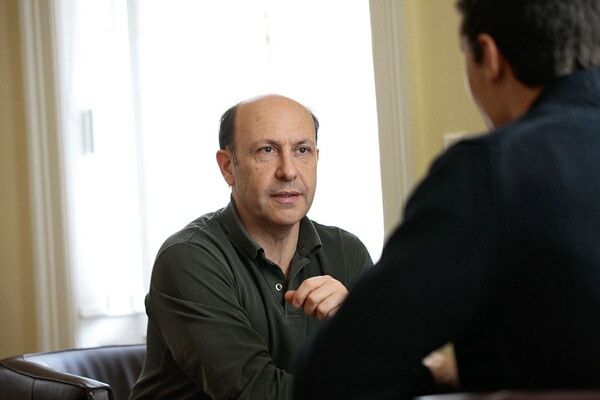 In no other intervention of cosmetic plastic surgery such detailed advice and accurate planning is crucial. For this reason, we make a digital photo of the nose and discuss with the patient desired changes using a morphing program. This way the desired outcome and the technial possibility can be matched, thereby avoiding unrealistic expectations and unpleasant surprises. 1. 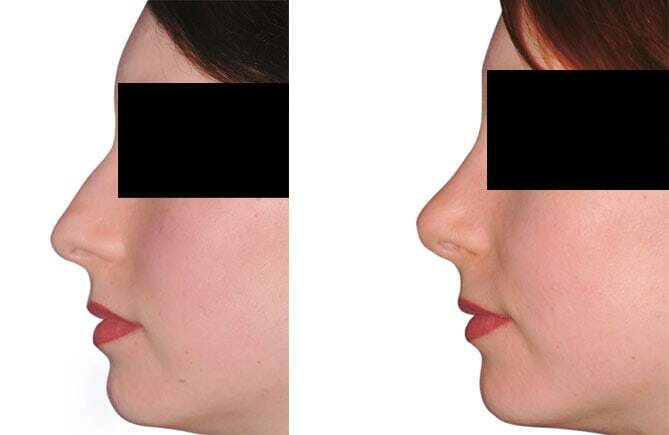 As of what age can rhinoplasty be performed? The growth of the facial skeleton is mostly completed at 18 therefore it should be avoided before then. 2. What can be corrected in a nose? Much can be corrected. 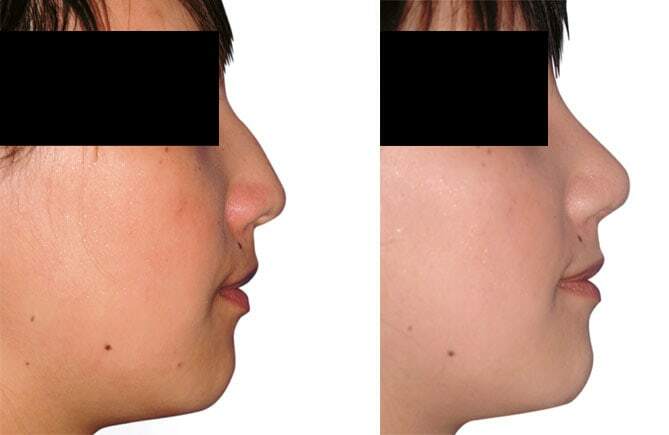 The most common corrections concern: the saddle, the procetion (length from the base to the tip), the shape of the bridge, the root of the nose (radix), the size of the nostrils, the angle between upper lip and nasal tip, the width of the nose etc. 3. Ideally, how is the operation planned? The planning of a nose operation consists of two stages. First, the request from the patient is recorded and then the proposed changes are simulated in a computer program. In this way the surgeon can judge whether the ideas of the patients are medically justifiable and aesthetically meaningful. Not infrequently the patient, after the simulation, realizes that the nose he wishes would not suit his face and he opts for another one that was conceived together with the surgeon. 4. Are there medical reasons for a rhinoplasty? A congenital defect or an accident can cause deformities of the nose; this would be considered a medical indication for the correction. The same is true for all congenital and acquired changes in the nose that lead to an impairment of nasal breathing. 5. Does health insurance cover the costs of the surgery? If there is a medical indication, the health insurance companies cover the costs for the operation. 6.What surgical methods are there? There are three surgical approaches: closed, half-open, open. Each method has its specific indication, and advantages and disadvantages. 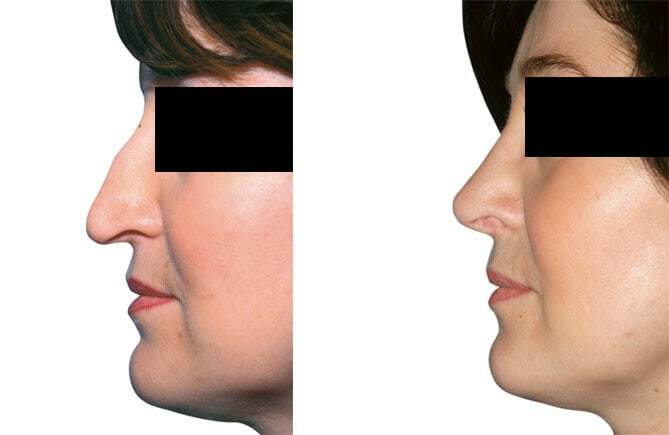 Therefore, any good nose surgeon should be proficient in all three methods. 7. Where does scarring occur? When closed and in semi-open method, the scars remain within the mucous membranes inside the nose. With the open method there is a barely visible, 2-3mm long scar at half height of the nose bridge. 8. Is the surgery always performed under general anesthesia? If the intervention is limited to the correction of soft tissue, local anesthesia can be used. If in the procedure the bone is involved, general anesthesia must be used. Medical complications include mainly bleeding and breathing difficulties. Much more frequently, the following aesthetic complications can occur: too much/too little worn hump; crooked nose; disharmonious bridge, bulbous nose tip and much more. Reparative surgery after unsuccessful rhinoplasty is often possible but requires great experience in the field of aesthetic nasal surgery. 10. How long is the hospital stay? Depending on the extent of surgery, one or two nights in the hospital should be expected. 11. When are you able to be social again after rhinoplasty? Depending on the extent of the surgery, the traces of the operation (swelling, bruising, etc.) you will be back to normal about two weeks after the operation. 12. 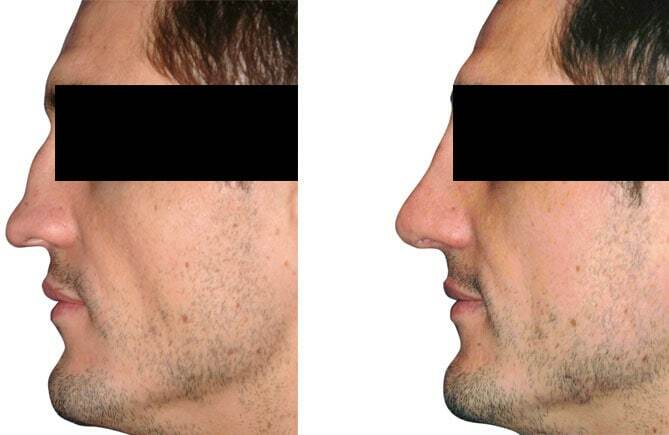 How does the length of the chin affect the appearance of the nose? The length of the chin plays a crucial role in the harmonious picture of the face. Ideally, the most anterior point of the forehead and chin make a plane. Deviations can often be corrected without extensive orthognathic measures . If you purchase the Enzyklopaedia Aesthetica book “Nasen- und Kinnkorrektur” (Rhinoplasty) ( EUR 34.90 ) the first consultation is free of charge! You can purchase the book during your first visit in the ordination or order it online. EUR 1.350 – 3.500, – depending on duration of operation, number of nights, room type (suite, single, triple) and hospital. In general, the procedure is performed under general anesthesia therefore an anesthesiologist is needed for surgery. The cost of anesthesia varies depending on the duration of the operation and is between EUR 500 – 1.200. An average cost of EUR 600-800 is to be expected. 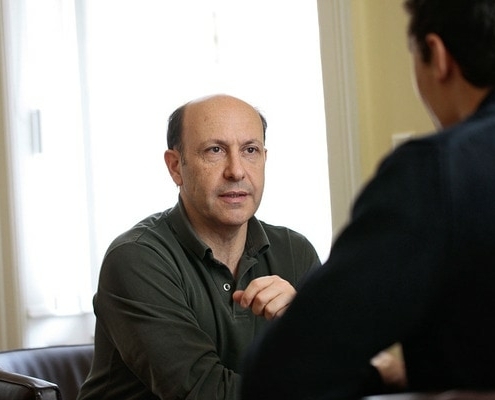 Depending on complexity and method deployed is the surgical fee of between EUR 2.000-8.000, – on average, must – be expected to be EUR 3.500-4.500. A nose correction should in principle be carried out in an ISO-certified operating room of a hospital. For a rhinoplasty, an inpatient hospital stay between one to three nights should be expected. OP-date set (take vacation, compensatory time or sick leave, arrange for child care if necessary, etc.). Two weeks before the surgery, complete the necessary preoperative exams (ENT results, blood lab, X-ray, EKG, surgical release). Discharge from the hospital usually happens 1-3 days after surgery. Please do not drive yourself. Take a taxi or let yourself be picked up. 2nd Follow-up Visit (approximately 10 days after surgery): Removal of cast.